PHOTO: Onlookers admire a model in head-to-toe snakeskin during a presentation by West Coast Leather. #FTW13. 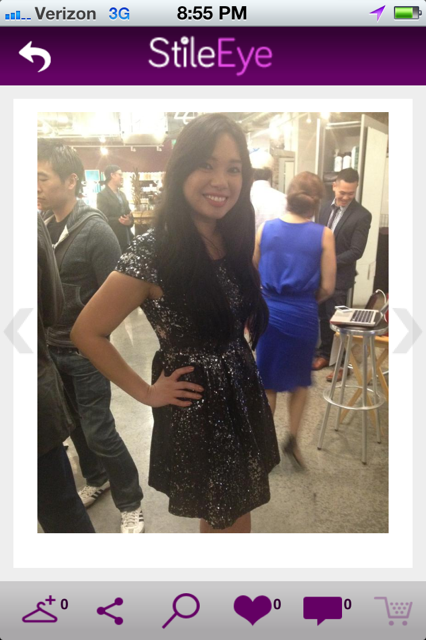 There were several hashtags circulating in association with Fashion Tech Week 2013, but I chose the quickest to type. Others, though probably more transparent for the uninitiated, lacked elegance and specificity. And in any case, FTW13 better echoes how I feel about my decision to relocate to the city of San Francisco: win. The Bay area is a hotbed of innovation on many fronts – technology, of course, but also education, business, culture, and social constructs. So while the rest of the country is talking about “democratizing fashion,” folks here are actually creating tools to do it. At least a dozen gave demos during FTW13, but a few stood out from the crowd. Here are my highlights. Stileeye is a mobile app and website that uses visual search to recommend fashion products. Members can take a photo of someone wearing an item they covet and the app will return results that try to match the item. Members can also upload items found on the web to get suggestions. To test it out I snapped a fellow FTWer to see what the app would come up with. The results are pretty good considering the less-than-clear photo. As of early March the app only works with dresses, but I’m told handbags are in the works. Instaply is a breath of fresh air because it’s one of only a few that isn’t trying some riff on a recommendation engine. The concept is that customers can connect with businesses quickly and on the fly, using a free text service. Being a fan of good customer service (not the empty, saccharin kind, but that which efficiently anticipates customer needs), this is the kind of app I would actually use. It seems prime for small fashion and beauty business who want to add a concierge-like element to their brand. I wonder, though, about the scalability of this app. If it gets popular will businesses have to have a person devoted to texting all day? While many are jumping on the online retail bandwagon, Boutiika is concentrating on innovating how we interact with brick and mortar stores. At first glance you might peg the site as yet another bookmarklet service. Yet look again and you’ll see that it actually encourages real life shopping. You can share items on the most used social platforms, but there’s no collecting or liking or any other, frankly, meaningless action. For my own purposes this site would be great for stalking the inventories of my favorite consignment shops, where items are usually one of a kind. If you see something you like you can reserve the item and pick it up when you’re ready.